Now it's time for you to get a hold onto this Harley Quinn Jacket, a master piece in it self. This apparel is made in the exact manner as featured in Costume Guide worn by Margot Robbie. The film goes on with many anti-superheroes who gathered together to save the world from the threats coming towards them. This movie cast Will Smith as Deadshot, Jared Leto as Joker, Jia Courtney as Boomerang, Viola Davis as Amanda Waller, Adam Beach as Slipknot, Jay Hernandez as El Diablo, Karen Fukuhara as Katana, Adewale Akinnuoye-Agbaje as Killer Croc, Cara Delevingne as Enchantress, Joel Kinnaman as Rick Flag and last but not the least, Margot Robbie. All these characters are well known villains of DC Comics but here they are going to play an important role in harley costume squad by saving the world. In the trailer of the film, the characters are seen working and helping the police and Squad team but for those who have read the SS Comic know that it’s all about politics. The whole team from movie suicide of super villains force has assigned to help the government in their secret mission. The team is assigned to help in return of shortening their prison sentences but this mission can drag all of them to death. The Squad is planned to be on theater in August 2016. Ben Affleck will also make his appearance as Batman in the movie. The film takes place in Toronto, Ontario, Canada. There are several different super villains going to be in the movie including The Joker and Deadshot. But above all of there, there will be Quinn that we all know about. The character of HQ (Dr. Harleen Frances Quinzel) is one of the best creations of Paul Dini and Bruce Timm. Harley first appeared in Batman: The Animated Series and then later she got her first DC appearance in The Batman Adventures. Quinn is affectedly in love with Joker and used to be his best crime partner of all time. The origin story of her and harley suicide costume states that she works as a psychiatrist at Arkham Asylum. She had her interest in reading books relating to psychopathic criminals and that’s where she met The Joker who was her patient. Squad quinn costume and its movie has been previously portrayed by different people like Arleen Sorkin, Hynden Walch, Tara Strong and Mia Sara. Now in Squad, it will be Margot Robbie who will be playing the role and have thus far, nailed it. As we know that in the movie, Quinn will team up with all other super villains in order to fulfill the government secret mission and to shorter prison sentences. The outfit that Harley will wear in the movie has been chased by many of her followers and they have made HQ as the hot trending Halloween character of 2015. Infact there are many other looks of Quinn that have been made famous. She will be playing a key role in the film and Margot Robbie is indeed lucky to make Harley debut on Big Screen. The size chart is accurate! This jacket is GORGEOUS! EXACTLY what I wanted and expected. I had emailed the customer service to check on my order status and they responded quickly and were very helpful! I highly recommend this jacket AND this company. AWESOME! Mi jacket is really as i dreamed , the delivery was quick, so i really recommend this site! I am a big fan of Harley Quinn from the day I start watching Batman: The Animated Series. Those were the good old day which really gives me a nostalgia feeling. She is evil and crazy so I really like it and Margot Robbie role as Harley was really amazing. I wanted to be like her so I finally found my dream website that sells her merchandise. I ordered this new style version jacket, received it in just 6 days and after wearing, I totally look like Harley only without the bat. A superb quality jacket, I will recommend this to every girl that want to become like Harley Quinn. Oh... my... god. This is the most BEAUTIFUL, most GORGEOUS jacket I have ever seen! It arrived today and boy, I do not regret a penny spent on this jacket! It is so beautiful, and matches the movie EXACTLY! I ordered one size up, a large, and it fit me perfectly so definitely go a size up! But other than that, I have no complaints, and the glitter print is beautiful and I LOVE how the glitter doesn't get everywhere! A+ ! Will do business again! Great Customer Service, Excellent Product. I have been ordering from this store for nearly three years now, and in all those years I have not been disappointed even once. Ok, once but that issue was solved quickly thanks to their quick and responsive customer service team. So when I decided to buy Harley Quinn Jacket this store was my first choice. And as always they didn’t fail to impress me. The jacket is perfect, fits really nicely, but what fascinated me was the logo at the back. Pure class and quality, this time fjackets has simply outdone itself. I was searching for the HQ costume and got the link of this jacket. It is a great product with attractive blue and red color. The rib knit feature makes it more attractive in my opinion as I like it very much. The inner lining makes it comfier. I was surprised to see that there are no bad review on this jacket which in rarely the case in such items. Made be a bit suspicious, but I ordered it anyway as this was the only store that had it in stock. But when I got it, I could see clearly that how much those reviews were justified. The jacket is flawless with each detail accurately designed, and the satin material makes it look even sexier. I had ordered this jacket for the Halloween party at my house. The jackets quality was impressive and at affordable price. I ordered my one by the size chart given and received the same. The jacket was received two days after the promised time which was actually disappointing. The customer service should have informed for such circumstances as I have to wear at the cosplay function. Although it was late the product quality was outstanding, so I am happy with it. I was a little concerned about the shipping time, as I saw it shipped overseas. I contacted them and got a timely response. I initially received the jacket fairly quickly, but unfortunately the jacket was a little too small for my daughter. We had to go up one size and I was concerned about being here in time for Halloween. I emailed every day and got a response, they shipped my replacement on Tuesday and I received it on friday 28 oct. My kids happy and so am I. Plus the quality is way better than the ones every store is selling. very pleased, ordered a small fits well. I was desperate thinking about what to wear on this Halloween but as the Suicide Squad released, I was confirmed to wear Harley Quinn outfit on Halloween. I found this site recommended on many places so without any hesitate I ordered it from here. This jacket is true to size, I ordered my original jacket size and got a perfect fit. But let me tell you one thing, I’m lucky that I waited for their New Style HQ jacket suicide squad to be updated in the list that is much similar to the original jacket. The material is soft satin with accurate glittered printed on back. It was fully lined inside and neatly packed. I got many awesome complements for my jacket and I proudly tell everyone to go to Fjackets and buy from there. I have also purchased the shorts, belt, gloves and shirt of HQ from here. Puddin is happy with the jacket. It was a tough job to find this jacket these days where Halloween is near and the demand of this jacket is high. If you get your hands on this Harley Quinn Margot Robbie jacket I say BUT IT! The jacket is extremely soft from inside and it shines a bit from outside. I ordered my usual size Large that fits great. I’m all ready for my Halloween 2016 and I will definitely wear it for a night out on the town. Puddin is happy Fjackets! I was so nervous thinking about where to get this jacket. At the time I have seen on other sites but they were out of stock. Luckily my friend who previously purchased the Jacket from Fjackets told me that there is a new style updated in the list that is much similar to the one that Harley Quinn wears in Suicide Squad. Without wasting a minute more, I ordered my jacket in size medium that arrived within 5 days. The jacket was nicely packets with “THANK YOU” tag on it and a free HQ poster. I tried my jacket and it was tight for me but I can still fit into it. I usually love to wear jackets with room but as far as Harley wore it tight and short so I can do the same. The material is good. The entire details are perfectly assembled on the back of the jacket. Zipper is good and pockets were big enough for an iPhone. Much appreciated seller and price worthy jacket. Deducting one star for sizing. The rib knit cuffs in golden color give it a perfect appearing. The trademark logo of Harley Quinn on the jacket, and elegant design patterns on it make it a perfect outfit for cosplay. The customer service was excellent too. They responded to all my queries promptly. I love the jacket which I received. The shipping was quick too. The jacket arrived at my address in a couple of days. This red and blue color jacket made from satin fabric are of very high quality. The golden lettering on the back makes it look beautiful. I had a lot of tiring trips to stores that had clothes but weren’t in my size or were just too costly. This is an ideal store that has the largest size, and they don’t charge extra on that. After ordering this Harley Quinn jacket, I have full faith in them, regardless of the issues that are always present. They are certainly the best. I was fascinated when their jacket was released all over the world by many online stores. Since I couldn’t trust any other store besides this, I waited patiently for it to arrive here so I could buy it. I have been ordering from this store now and then for years. I like their policies, and that is why I feel comfortable in ordering from here. Now when I saw this pic, I couldn’t believe it. This has everything to be a show stealer, and I couldn’t be any more contented. Satin is known to be light in weight, and the jacket even looks like it will be. After keeping that in mind, I didn’t know it would be so light that won’t feel like I’m wearing it, to begin with. I love it so much. Thanks, FJ! I really liked my jacket like other mentioned in their comments. The quality is impressive. The satin fabric is much comfy and the thick golden fabric also feels great. The Glittered Logo at back looks beautiful and exactly like the original one. The tissue was placed on it carefully that shows the extra attention on packaging which was totally unexpected. I ordered medium and it’s a good fit. I will definitely wear it on Halloween and for casual outing. I originally purchased the new style Harley Quinn jacket in large size. I was confused to see that they have raise the price but after watching the different in both, I was confirmed what I have to order. They provided best attention on the quality and details of the jacket. It’s good and a beautiful piece to wear as cosplay. True to size and exactly the same like Harley’s. This jacket is great. I literally fell in love soon I opened my jacket today. It was a bit doubtful to buy this jacket but in the end everything went right. I got a tremendous quality jacket. This jacket is the most accurate to the Harley’s jacket that I have seen so far. It really worth purchasing and I recommend it. I purchased this jacket to wear on Comic-con. This is a nice product and everyone appreciated my style on the event. Thanks Fjackets for making my day. I absolutely love this jacket!!!! Really impressed with the colours and quality. It does fit a lil on the small size so I was glad that I ordered a large.....super fast delivery as well!! Great job!! This jacket is much similar to the Harley Quinn’s Suicide Squad jacket. I waited for so long for the jacket and for more pictures and took a chance to grab the jacket from here. I got a perfect fitting jacket. I usually wear small jacket and sometime I try medium as well for length and with this jacket, I decided to order it in medium because it has rib knit and will help in the fitting. The material is shiny and goes on the original look. Nice outfit. The fitting of the jacket is tremendous. I usually wear x-small tops but I went for the size small because I felt that medium will be too big and lose for me. I’m 34C, hips 36 and waistline is 26. It’s neither too tight nor too loose for me. I got a perfect fit jacket at the best price. No regrets in spending my money on this jacket because it’s a delightful and good fitting jacket. I seriously got for what I paid. This is not just a costume jacket but also eligible to wear as normal jacket in fall. I ordered it one size up because I want a loose fitting jacket. 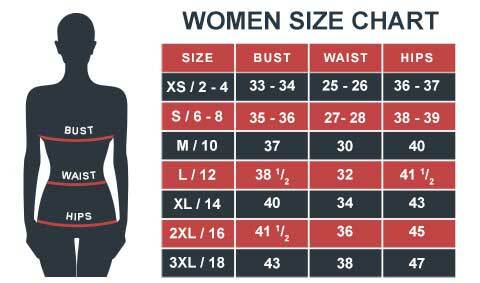 If you want a slim-fit look then order your actual size, if you want loose then order one size up. I got my jacket in best packing ever. I received my packet sooner than I expected. It says the shipping time is 7 working days and I got it in just 4 days. I was very curious about the print at the back of the jacket but Thank GOD it was just as expected. At the center of the jacket in golden color! I get an issue with the length of the sleeves. It was a bit small for me. I should have ordered a size up.